We're in the middle of a workplace revolution. Attention architects, interior designers, product designers, and design students! We challenge you to think ahead, to 2021, and imagine how today’s workplace will evolve and transform. Digital technology has given us unprecedented connectivity and mobility. Environmental concerns are real and ever-pressing. We need design thinkers to focus on tech and environment and come up with innovative proposals for the humane workplace. Will the future of work redefine what the workplace is or does? What will create even more changes in the workplace than we're already experiencing? 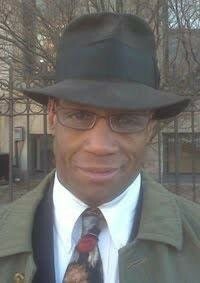 What will work look like? How will workplace design support workers' needs for privacy, light ,nature, noise reduction, community, health? How will offices enable workers to be the best they can be? 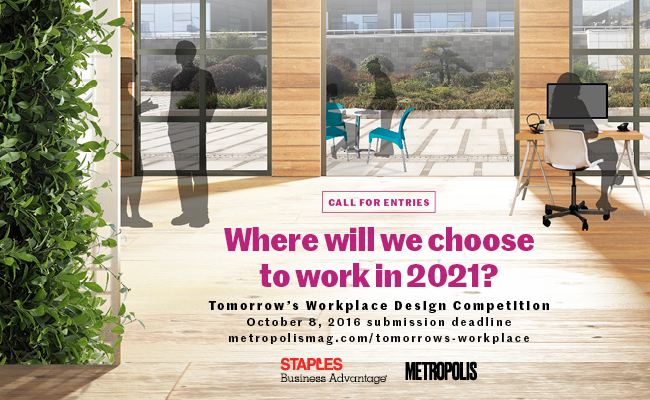 Tomorrow's Workplace Design Competition asks you, the design community, to imagine what our work lives will be in the next 5 years. We seek holistic designs that assess and emphasize the next phase of the ongoing workplace revolution. The $7,500.00 prize, plus world-wide publicity, will not only position the chosen team or individual as leader(s) in innovative workplace design, it will propel the winning vision closer to reality. 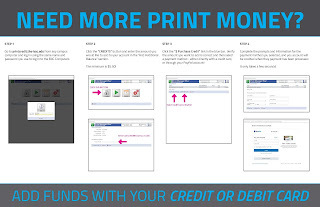 There will also be a $2,500.00 runner-up prize. 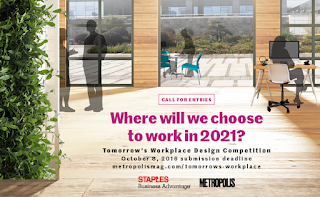 Tomorrow's Workplace Design Competition is presented by Metropolis magazine and Staples Business Advantage. The Call for Entries for Tomorrow's Workplace Design Competition opens on June 10, 2016 and runs until October 8, 2016.